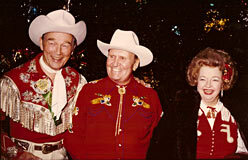 Gene Autry's association with Christmas and with the Hollywood Christmas Parade is widely known. Johnny Grant, Honorary Mayor of Hollywood, commented on this in the liner notes of the 1997 Varese Sarabande Records CD release Here Comes Santa Claus. 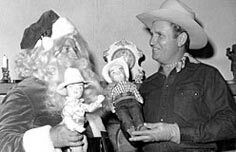 Gene Autry was Santa Claus 365 days a year. During the Yuletide Season, he became "Super Santa." He was a very generous and giving man. Musically, the holiday season was Gene's franchise. Wherever in the world the USO sent me during Christmas, I heard Gene Autry's voice on Armed Forces Radio singing "Rudolph, the Red-Nosed Reindeer," "Here Comes Santa Claus," "Buon Natale" and so many others. To his fans worldwide, Gene Autry personified the spirit of Christmas. Gene Autry was responsible for keeping one of the world's greatest Christmas traditions alive. When I informed Gene that the Hollywood Christmas Parade was suffering bad times and needed some assistance, financially and in the production area, he said, "Tiger, do whatever it takes." He never asked or knew how much of his money we spent to bring that parade back to a class-A holiday event. Drawing approximately one million spectators along the parade route each year, it continues to be Hollywood's biggest single-day event and is the kick off for Hollywood's holiday season. 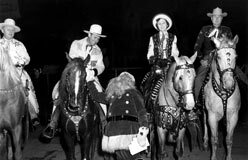 My job of producing the Hollywood Christmas Parade was always much easier when Gene Autry's schedule permitted him to commit to riding in the parade months ahead of the event, as other celebrities were always anxious to be in his presence and enjoy his company and wonderful holiday spirit. Gene Autry greets Santa Claus at the Santa Claus Lane Parade 1946. Gene Autry at the Hollywood Christmas Parade 1980. 1928 – Two reindeer and a sleigh ride down Hollywood Blvd to open the Christmas shopping season. 1932 – Floats and cars added. 1937 – Gene Autry rides Champion in the parade. 1937-1941 – Gene Autry is in the Santa Claus Lane Parade but confirmation of dates is unavailable. 1941?-1944 – No Parade during WWII. 1945 – Parade returns. Gene Autry in parade, no information available regarding which horse used. 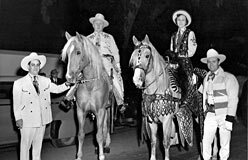 1946 – Gene Autry rides Champion Jr. in the parade. 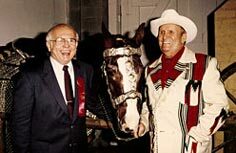 1947 – Gene Autry rides Champion Jr. in the parade. 1978 – Parade renamed Hollywood Christmas Parade; KTLA, owned by Gene Autry, broadcasts the parade. 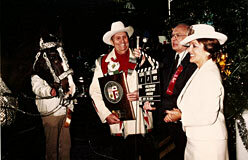 1980 – Gene Autry is the parade's Grand Marshall; rides in convertible automobile in parade. 1981 – Gene and Jackie Autry ride in convertible automobile in the parade; Maxine Hansen, Executive Assistant to the Autrys, helped out with parade. 1982 – Gene and Jackie Autry ride in convertible automobile in the parade. Gene Autry, far right, and other prepare for the Santa Claus Lane Parade in 1946. Roy Rogers, Grand Marshall Gene Autry, Dale Evans at the Hollywood Christmas Parade 1980. Jon Guyot Smith 1999; "Autry's Aces" March, April, May and December 1947; January and February 1948; BIG REEL article December 2001 by Roy Nuhn.